Inagas will be demonstrating our gas filling solutions at two global glass exhibitions in September - GlassBuild America in Atlanta and Gulf Glass in Dubai. With strong roots in the North American IGU markets, Inagas - the leading supplier of gas filling solutions - will be back at GlassBuild America 2017 with even more innovations. It’s fitting that we're showcasing our range in conjunction with distributor partner, Quanex Building Products on Booth 1919 under theme of The Future of Fenestration is Here. Inagas Director Chris Kemp comments: “The North American IGU markets are hugely important to Inagas. 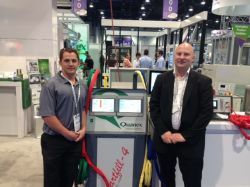 Since our partnership with Quanex Building Products we’ve sold and installed over 100 gas filling machines to IGU manufacturers across the USA. This year, visitors to Booth 1919 will see live demonstrations of our ground breaking SmartFill 4. We're also demonstrating our credentials as a global manufacturer and supplier by exhibiting at this month’s Gulf Glass event in Dubai. In partnership with our Middle East agent Tec-Pro Group, you'll find our Interfill solution being demonstrated on stand 4E91 in Hall 4. "we’re delighted to be sharing the latest gas filling solutions with global markets at GlassBuild and Gulf Glass 2017"
Chris continues: “The Smartfill 4 on show at GlassBuild America is a four-line machine designed for high production of Argon gas filled insulated glass units. Each line operates independently from the other with a combined maximum flow rate of 120 litres per minute using the revolutionary patent-approved Smartstart lance system. The first gas filler to feature a touchscreen menu, the Smartstart system allows an operator to remotely start the gas filling process by pressing a button on the lance body instead of having to return to the machine. The lance body incorporates an LED light, which on activation of the filling process turns green, then red on completion of the fill cycle. To match the increased emphasis on quality and production traceability, the Smartfill 4 is also available with data logging and a print facility that records the date, time, gas fill level, fill cycle time and line number of every gas filled IG. "In contrast the Interfill machine on show at Gulf Glass is a more compact solution for lower volume filling. It's a single line, 30 litre a minute machine that's capable of gas filling using a one or two hole filling method. In it's KX form it features variable vacuum and flow rate control, making ideal for gas filling with Krypton/ Xenon or mixed gases, as well as Argon. Visit Booth 1919 at GlassBuild America in Atlanta, or stand 4E91 at Gulf Glass in Dubai to find out more.